San Francisco: A founding principle of General Motors was to supply a car for every financial level of buyer, and then work those customers up through the system. So, if you could snag a young motorist with modest means into your Chevrolet showroom, you could eventually sell them a Pontiac, an Oldsmobile and then a Buick on the way up to a Cadillac when they made their fortune. Nowadays, first-time buyers and retirees are attracted to the low sticker price of Toyota and Honda’s starter cars as well as models from the ascendant Korean manufacturers of Hyundai and Kia. GM has entered the fray with its Aveo, which although it wears the GM “chiclet” on its fender and the Chevrolet name on its trunk lid, it’s made by Daewoo, which is a quiet member of GM’s worldwide network of automaking. The captive Korean is selling pretty well, and to speed up the process, GM has thoroughly updated the sedan version of the car, which is sold alongside the previous generation five-door hatchback. Entry-level cars are designed to provide affordable, reliable, and economical transportation. The real challenge, with the above constraints, is to add some enjoyment and pride to the experience, and my Victory Red Aveo LS seemed up to the challenge. Slightly longer and wider than its predecessor, and with more attractive “big car” styling, it was not embarrassing to be seen in. With its chrome grille, sparkly headlights and taillamps and mini-Audi lines, it doesn’t look like a mere appliance. Inside the Aveo, today’s trend toward metallic accents is apparent and well rendered. No surfaces cry out “budget” when you see them. Although the interior panels are mostly hard plastic, they don’t look particularly cheap, and they wear a European car style satin finish. My tester featured hand-crank windows, which was a nostalgic throwback to my first cars years ago, and old-fashioned thumb buttons on the steering wheel activate the horn. But the Aveo otherwise feels modern and comfortable, and starts at just $11,950. The LS model comes with intermittent wipers, air conditioning, a rear window defogger, tilt steering wheel, AM/FM stereo audio system with four speakers and a place to plug in your iPod, a digital clock, and even vanity mirrors on the sunvisors. The LT model adds more, including larger, 15-inch alloy wheels, heated outside mirrors, cruise control and keyless entry, power windows (thank goodness), a CD player with two extra speakers for the audio system, and fancier seats. Numerous options are available, and my LS tester had almost $2,000 worth, which made it more like an LT. It even flaunted a small spoiler on its trunklid! Items like cruise control, upgraded sound system, alloy wheels (14s, not 15s), and antilock brakes brought my tester to $14,500, still a pretty modest outlay. Modest is a good way to describe the power under the hood. The Aveo uses a 1.6-liter inline four-cylinder engine, typical in the entry-level segment. It puts out 103 horsepower and 107 lb-ft. of torque, which propels the 2,500 pound car along well, as long as you don’t plan to accelerate briskly uphill or race anyone for pink slips. Through the five-speed manual, the car feels up to the job, cruising quietly on the freeway and darting about nimbly in the city. A four-speed automatic is available. 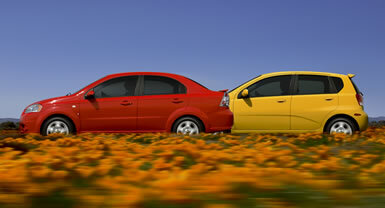 The Aveo earns fuel economy ratings of 27 City, 37 Highway, which are good if not class leading. Its environmental rating on the EPA’s Green Vehicle Guide is 7 for the Air Pollution score and 8 for the Greenhouse Gas score. That puts it on page 4 of an 82-page list, and demonstrates how small engines simply put out less pollution. Although the Aveo is meant to attract first-time and economy-minded buyers in America, around the world it will eventually represent GM in more than 120 countries, usually as a Chevrolet, and it is currently the top-selling Chevrolet model in Europe. The Aveo sedan is more of a grown-up sedan in miniature than, say, a trendy hatchback like a Scion XB, but it offers a lot of car for the money and appears to be well made and Chevrolet dealers are everywhere if you need them.